Hannah eyeing the pregnant lady in the lounge chair, we made our way over to a shaded table to plunk down our towels and kick off flip flops for an afternoon poolside. The kids love the pool. Without fail they inquire the precise time we will be going to swim each morning. Kids off and splashing I sit down and smile at the lady and preemptively apologize for my daughter’s obsessive staring. She laughed and we chatted for a bit. Of course hindsight is always 20/20, but time has a way of warp-speeding when viewed through a rear view mirror. It sure doesn’t seem like it’s been a decade since I was first pregnant myself. But here I sit with an almost 8 and 10 year old, chatting with a young mom. There have been some big milestones in our world. These self-proclaimed big kids are riding bikes to the nearby playground, exploring our new place – stepping into their first bits of independence. I remember wondering about my then-infant and toddler when my sister and her daughters came to visit us in Hawaii. It seemed like so long until I would be able to just enjoy our time swimming instead of worrying and being on patrol, ensuring safety. I remember marveling at moms who sat poolside looking at their phones while their kids played and swam, part of me loving playing in the water, part of me longing for the day when they would find friends and play on their own. That’s motherhood in a nutshell, I suppose – being divided. Not only daily working ourselves out of a job to grow independent and hopefully productive adult humans, but also wondering what the next step will look like, while simultaneously reminiscing about previous phases. Flash forward to our time in Texas where they both had swim lessons and became comfortable in the water. Playing in the waves on South Padre Island still made me nervous, yet they had no fear, jumping and giggling as waves crashed and tried to knock them over. Here I sit today, book in hand, sipping on an iced coffee (because I have waded through cardboard seas to rescue my coffeemaker from an ocean of chaos) . Yet another little step, them in the pool making friends, practicing tricks and flips and jumps. My mermaid and merman happy to swim and soak in all of summer in our new home. “Mom?” Hannah asks, as we gather up our stuff to leave when the need for food overpowers the need to be submerged. “Sure thing Hannah,” I say smiling. I think we’re going to like it here. Sitting on the shore at the Ko’olina lagoons four years ago, my sister and her daughters jumped right in splashing and playing like three long haired mermaids. They were out visiting and I so enjoyed a peek into the future of what life looked like with kids slightly older than my own. 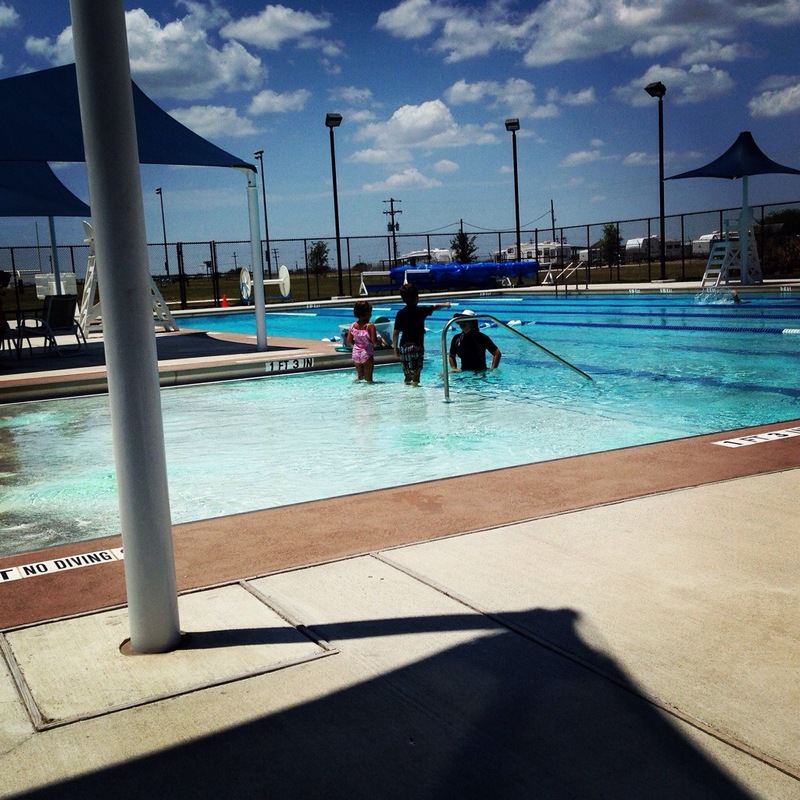 How I marveled at the thought of my then 3 and 1 year old swimming solo. Would I ever get to the point where going to the beach wouldn’t be work? Or a whole lot of sitting on the shore ensuring they had their floaties on and not going out too far? When would the enjoyment of just playing in the water with the kids take over the watching and the worry? The minions have been enjoying their summer break, the pool, the warm weather, the pool, riding bikes, skating and did I mention, the pool?! Last summer, they were timid and didn’t want to get their faces wet. We did swim lessons, and they made some progress. But this year, Jake asked what it would take to get to go down the slide at the deep end of the pool. Nothing like a little motivation, right? They don’t allow floaties and was told he would have to pass a swim test. And so he did! He splashes down that slide without plugging his nose. He doesn’t wig out when water gets on his face. He plunges in over and over and paddles his way to the side to do it again. And again. And again. We’ve gone to our local water park (with HUGE waterslides) and the kids have a blast! Hannah and I put on our goggles and make silly faces under the water, blowing bubbles, and playing underwater chase. She goes down a smaller slide and tries to splash me as much as she can as she lands with a wide-grinned goggle face. I get to relax. I get to enjoy them. I conquer my fear of heights and climb those stairs so I can go down the slides, too! The camera sits in the towel bag. My hair gets messed up. We all have goggle rimmed tan lines around our eyes. We get exercise and we sleep soundly with the sun-kissed contentment of a summer thoroughly enjoyed. This is our mermaid time. And I’m loving it! I love days where you just want to pump your fist and say, “YEAH! It was a good day!” Today? Meh. We were all crabby today. The novelty of being in the same room (same car) with the same people for 5 weeks has worn off. Having space in our new joint will be a good thing, for all of us! Having a few things on the agenda for the day, we started out with swim lesson number 2. The kids are doing great, becoming more comfortable in the water. Hannah is getting better and putting her face in the water and blowing bubbles. Jacob hollers at the instructor that he’s “NEVER DOING THAT AGAIN!” but then ends up going under water again. She’s amazing at pushing to the edge of his comfort zone, but then backing off and giving him something to do that builds his confidence again. She’s very gifted with kiddos. Unfortunately, the lesson got cut just a tad short as the thunderstorms rolled in. Hannah: Happy in the water. Jacob: Crabby at the instructor, but his desire to learn is overcoming his disdain for her. Also dislikes being told to get out of the pool. Who cares if there’s lightening? Me: I’m just happy that I’m not the bad guy! Yay! From there we went to Target to pick up a couple things and an air mattress. (Jake’s popped from taking one too many jumps.) Target is always a good time and I found a lycra swim cap and goggles so I can swim some laps on the really hot days instead of running. (Running in this humidity feels like running into a hair dryer on the hottest setting. No bueno for this chick.) Note: If you have curly/large hair, lycra caps are SO the way to go! They don’t pull/snag/stick to your hair! And they are easier to put on! Hannah: Flibbertygibbet self. Happy to be. Although slow to buckle up and get into/out of the car. Eric: Mildly irritated that Hannah is in her own world. He cannot comprehend why it takes her so long to get buckled every time we get into/out of the car. Jacob: Happy to have his iPad back. Slightly irritated that the A/C doesn’t blow cold air as fast as he’d like. Me: Sad I can’t be in Target solo. Happily dreaming of swimming laps at the pool in new goggles and swim cap. Solo, of course. We stopped by the new house (which is near the Target! YES!) to check on progress. Looks like we should be moving in next week! Yahoo! Every time we go and check things out, it fuels the anticipation. (Or the impatience.) I cannot WAIT to live in this space. Finally, we rounded out the day with a “Dive-In” at the base pool. We loved our local drive-in back in Whidbey. Sadly there are no drive-ins here, but the base pool opens up occasionally for an evening kid movie on a giant screen while we swim! It’s awesome! And the bonus was the kiddos got to practice their swim skills waiting for the Lego Movie to start! Jacob did it by himself. He apologized using all 4 components. No prompting. (I checked with Eric – he didn’t prompt at all!) It was purely Jacob’s initiative. He was thoughtful and logical with his reasoning. I was beyond astounded. Jacob: Apologizing to me. Of his own volition. Not necessarily enjoying it, but doing it without anger. Me: Blubbering mess, fist pumping the day. Today is not only my daughter’s 4th birthday, but it was also both of the minions’ first day at swim lessons. Having attempted this before, I was crossing my fingers hoping it would go well. As a baby, Jake positively detested water on his face, or in his ears and would scream the entire lesson. He didn’t like the instructor, who was wonderful, and by the end of class, he didn’t care much for me either. Fast forward nearly 5 years and we have made serious progress! The first lesson included kicks, splashing, back floating and the usual first class activities to acclimate them to the water and build their trust with the instructor. By the end of the 45 minutes, I sat poolside trying to pick my jaw up off the ground. •Push past the fear. Sometimes you need a coach (or your sister cheering you on) to give you the boost of confidence you need to take that first plunge. Take that boost where ever you find it and use it to push forward. The people in your corner will help you if you need it. Or, they’ll clap when you finally do what they knew you could all along! •Trust Trust in the people around you that have earned it. When they’ve earned your trust – they won’t let you drown. •There is value in letting others love and teach our kids. I don’t know everything. Yes, I know my kids better than anyone else, but professionals, be it teachers, speech therapists, counselors or what have you, all deal with many children. They have all kinds of tricks up their sleeve! (and I will beg, borrow, and steal any and all effective tactics!) could be a way to handle a difficult day, or even a way of communicating that works like a charm. I was emotional watching the kiddos bond with this teacher, and not from a “I want them to myself” kind of way, but more just joyful in watching her work with them and have them both respond so positively. Seeing their little pride-filled chests puff out as they did something for the first time was incredible. •When you accomplish something awesome, celebrate the heck out of it! My car was so loud for all the talk coming from the back seat! “We are so cool!” “We can swim now!” “I got water on my face and didn’t even freak out!” “I’m a water master!” Do your happy dance. You’ve earned it! •Know when to throw in the towel (for the day). When you are at your limit, it’s okay to take a break, take a step back, or come back to it later. Knowing our limits keeps us from getting frustrated, losing our temper, or even giving up. Small doses are a good thing sometimes. The kids’ next lesson is on Saturday. I can’t wait to see what we’ll all learn! I had my first swim lesson today and I already feel so much more comfortable in the water and with my breathing!! Hooray!! Since training for the marathon and upping my bootcamp days to 3 days/week, it has come to my attention, ahem, my dear husband pointed out, rather, that I haven’t been as diligent with my off day cardio and perhaps that might be a factor in my not seeing the numbers move on the scale. I so hate it when he’s right!! 😉 So I had to swallow the fact that I had indeed been a little lax. I will run 5-6 tomorrow then swim (practicing my newly acquired technique!) and prep for the biathlon. Work 6 days, rest 1. That’s what I did in the beginning. And that’s what I will do again! I am back at it with renewed energy, no more excuses. Just doing it. Michael Phelps and a Grumpy Curmudgeon! 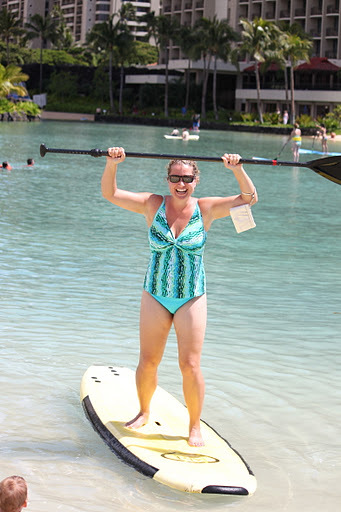 So while preparing for my biathlon next month, I decided to swim at Hickam beach. It’s gorgeous out there and not a whole heck of a lot of people because, well let’s face it – it is the day after Christmas and only CRAZY people like me are training for biathlons instead of shopping! So as I am swimming what I think is a 1k (when actually it was 1250 meters! More of my mad addition skills hard at work!) I notice an older gentlemen doing some water walking laps. I am swimming up by him and catch his eye. Now the old me would have just smiled and kept on my merry way keeping to myself and doing my thing assuming he doesn’t need to be bothered. But no, I smile all big (while simultaneously trying not to swallow the ocean that keeps biffing me upside the head) and say, “Is it just me, or do they keep moving these buoys farther away? !” Basically just making light small talk and acknowledging that we are both CRAZIES out here working out the day after Christmas. Yes, I am taking lessons from my hubby Neighbor Ned, and trying to become more Neighbor Nan-like! So as I’m nearing my 10th and final lap, I notice a lady walking along the beach with a walker. And then I realize its probably his wife. He slowly comes out of the water to retrieve the walker and make the uneven journey up the sandy beach. Yeah, ok. I suppose if I had to walk with a walker and get exercise in the water and some flippant little squirt came swimming by me, I’d probably want to not make chit chat either. My big lessons of the day? Well, you never know what’s underneath the surface. He may have just had a bad day, or maybe he was in pain. Perhaps missing his family over the holidays. Whatever the reason – I’m still gonna be me and chat people up, even if they don’t respond. Secondly – to never take my health and abilities for granted. I can swim well enough to save my own life. I look like a complete idiot doing it, but physically – I CAN swim. I CAN run. I CAN bike. My body is young and strong. I will not take it for granted. And finally – I am never gonna be Michael Phelps! Have you ever felt foolish while trying to engage a stranger to make small talk? So often we focus on what we aren’t able to do. What CAN you do? Ever been on the other side of the coin and known that you’d made someone feel like an idiot when they tried to engage you? Over the past 6 months I have done things I never thought I would. Things I never thought I could. in addition to losing almost 45 pounds, 20+ inches, and seemingly shedding sizes weekly, I’ve gained an incredible amount of confidence. And it’s not just confidence in appearance, although there is that too. Or little stuff like chatting up another mom at the playground. Before I would have waited until she said hello first. Not anymore. I’ll chat with her. No fear. I like not being afraid. And if I fall on my face? Yeah, well, it’s happened. And it will happen again. I’ll just have to get up again. And now as I look forward to my next event, I’m a little unsure of myself. I signed up for a biathlon. No, I signed up for TWO biathlons! One in January and one in February. They are both 5k races followed by a 1k swim. Um, have I mentioned that I don’t even own a swim cap? Or a one piece competitive bathing suit yet? I think I may have goggles around here somewhere. And do they make swim caps large enough for my big hair?!!! Ha! You bet! And I can’t wait!